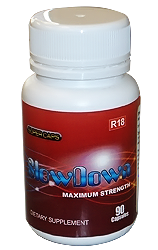 SlowDown is a fine blend of naturally occurring calming herbal extracts that are ideal for meditation, relaxation, calming nerves, and aiding with insomnia. Each capsule contains: Valeriana officinalis extract, Lactuca virosa extract, Passion flower extract, Niacin. Each bottle contains 90 capsules. Dosage: The usual dose is 1 – 3 capsules, 1 hour before the desired effects. Warning: Do not operate machinery or drive after taking this product. Do not exceed the recommended dosage. Not for sale to minors (under the age of 18).